I complained bitterly about being made to watch a movie called ‘Happy Go Lucky’ some time ago, and I unfortunately bought tickets tonight to a critically acclaimed movie, which turned out to be by the same director. It was almost the same movie as the sadistically irritating ‘Happy Go Lucky’ too, except that instead of featuring young Mancusian schoolteachers, it featured old Londoner gardeners, and was less annoying to a predictable degree. While ‘Happy Go Lucky’ was a study of work-a-day bubble-headed cheerfulness, ‘Another Year’ is a drab and plotless examination of garden-variety loneliness. With every critic fawning over this film, I feel a bit like the child in The Emperor’s New Clothes, asking whether there’s anything there. The characters are involving enough, but the handing of the material feels shallow, artless and ham-fisted in comparison with polished pieces such as The King’s Speech. The writer-director, Mike Leigh, tries to capture moments of everyday life, which in ‘kitchen-sink’ England means lots of ashen-skinned people being glad that it’s not raining and sad about everything else. And then they drink lots of wine and say pointless things like ‘for my sins’ a lot. 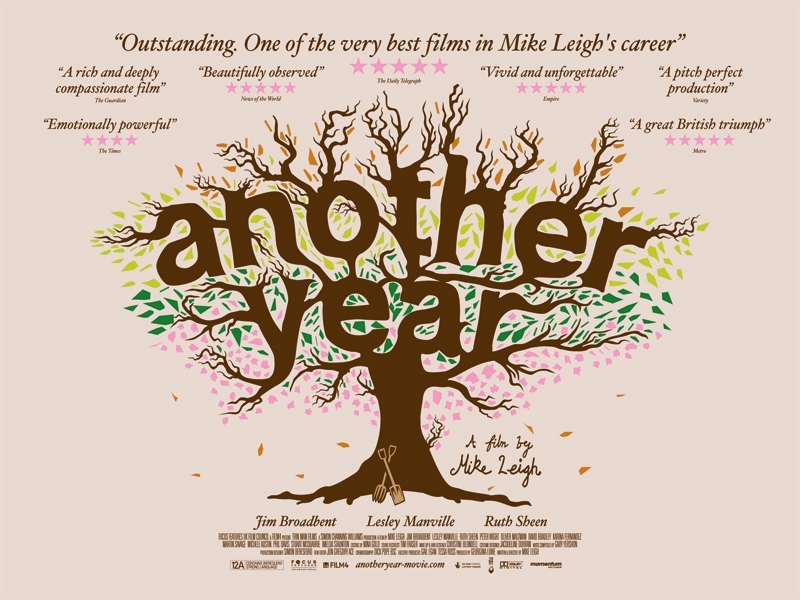 ‘Another Year’ successfully captures the lack of pace and unedited feel of daily life, and yet strangely Leigh cannot avoid making it seem artificial. Highlights of the film included an interminable sequence in which Leslie Manville puts on a painful slurred-drunkenness act, and a dinner with a character called Ken who had clearly been directed to talk with his mouth full, because no matter when the camera catches him nor how much he’s concurrently drinking or seeming to swallow, there is always a chunk of food in the left cheek. A clumsy, awkward, slow, ragged and annoying film. But still miles better than ‘Happy Go Lucky’. Almost by definition, stories must have a Predicament – a defining point of conflict that drives a story forward – and a plot – events connected together by cause and effect, by which the conflict is raised and resolved. Without these things, a story isn’t a story. Mike Leigh sets about challenging these assumptions in his film Happy-Go-Lucky, a film about… uh… uh… Hmm… Well, you see… Um, there’s this girl in it? She’s a pre-school teacher, and we see a bit of her doing that… Um… She’s quite nice to the kids, but she’s a bit of a thicky herself, so… Oh yes! and she’s taking driving lessons with this angry guy. He physically attacks her for being an idiot towards the end, but he clearly has a point. That was quite a good bit actually, or it seemed to be. I had put on the headphones at about the 1 hour 45 minute mark, but it looked dramatic… Oh that’s not all, she arbitrarily wanders around at night and inexplicably follows the sounds of someone shouting to himself in the back end of an industrial area. Instead of getting murdered, she pretends to understand the ravings of the crazy homeless man, because she’s that kind of sensitive. The pretentious kind, evidently. So there’s a bit of character study here: a charming and witty woman (read unbelievably grating child-in-an-adult’s-body) seems to be pathologically irresponsible, but when the chips are down, she expresses tenderness towards the unlovely. That’s all terrific if you don’t mind 2 hours of someone saying banal things as though they’re jokes, and then making a little inhaled laugh at the end of every sentence, irrespective of the humour content. But seriously, nothing happens. Nothing. Can I be clearer that there is bland scene after bland scene that have no connection to each other, but that they feature the same annoying laugh-breath punctuation. We watch a class of kids making paper-bag-bird-hats. For A-G-E-S.
A friend of mine gave me a money-back guarantee that this was worth renting, but that’s not good enough. I want him to pay me for the time that I lost and that I’ll never get back. I’m not the kind of movie-goer who needs explosions and fist fights. I quite enjoyed that Sandra Bullock drivel where she’s the evil boss who’s actually a softie and has to marry her assistant for a green card (I should probably just have looked up the title; that took ages). I also sat through three hours of Dogville and loved it. This was rubbish. The only value in Mike Leigh’s apparent underlying question in Happy-Go-Lucky (‘Does a story really need a Predicament and a plot?’) is that we discover that the answer is yes. 2/10 – Go and read a book.